There is currently no direct train from Kuala Lumpur to Bangkok, so you will have to make a stop or two along the way. There are a number of ways you can make the trip from Kuala Lumpur to Bangkok by train, all of which will require changing trains and spending a few hours in transit or spending the night if you prefer. Most people will make many stops when making this journey and you will find all the best places to stop below, with a few suggestions on places to visit along the way. Now that the International Express that used to operate from Butterworth is terminating / originating from the border station of Padang Besar, this is the most direct way to get to Bangkok by train. Another slightly cheaper way is to take the train to Padang Besar, then take a Shuttle Train from Padang Besar to Hat Yai in Southern Thailand. Once at Hat Yai station, there is a choice of trains to Bangkok (most are cheaper than the International Express Train). You may have to spend a few hours in Hat Yai and there is a left luggage facility at Hat Yai station, so you can leave your bags and have a wander around the city. From KL Sentral railway station there are a number of ETS Trains a day to Butterworth Railway Station, which is right next to the ferry terminal to Penang island. Please Note : The International Express is no longer departing from Butterworth and now departs from Padang Besar station on the Thai border..
You will now have to take a KTM Komuter service to Padang Besar to connect to this service. A much longer way to get to Bangkok from KL is to take an overnight train to the north-east of Malaysia, then a bus to the border. Just after crossing the border the Thai Railways line begins at Sungai Kolok. Due to the troubles in the very South-East of Thailand, we would currently not recommend travelling this way. Booking your train tickets in Malaysia is easy as you can either book them directly from any Malaysian railway station or online from the KTMB website or online ticketing agents. 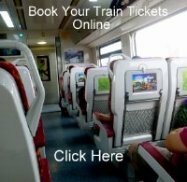 Booking train tickets in Thailand is now available online. If you have plenty of time there are many places of interest along the KL to Bangkok train route. The most popular first stop is the interesting city of Ipoh with its old colonial buildings and bus connections to the Cameron Highlands. Next on the list is the island of Penang which can be reached by a short 15 minute ferry ride from Butterworth railway station. Penang has plenty of places of interest including the World Heritage area of Georgetown, beaches at Batu Ferringhi and jungle walks in the Penang National Park or around Penang Hill. From Penang you can continue your rail journey up to Thailand or catch a ferry north to the Island of Langkawi to enjoy some of the best beaches on Malaysia's west coast and some duty free beer! From Langkawi you can rejoin the railway line at either Alor Setar or Arau to catch the train to Thailand, or continue by boat and do a bit of island hopping along the islands of the West coast of Thailand. Once you arrive in Thailand the first big city you come to is Hat Yai. Here you can transfer to buses or minibuses to most popular tourist destinations such as Phuket, Krabi, Trang, Koh Lanta and Koh Phi Phi or continue on the train up to Surat Thani where buses will take you off to the ferry terminals for boats to Koh Samui and Koh Phangan or catch a bus from the station to Phuket and Krabi. Once you get past Surat Thani the railway line takes you along the east coast of Thailand to some lesser known beach resorts around Lang Suan and Chumphon. If you have been out to the Gulf of Thailand's island you can continue your rail journey from Chumphon by catching a ferry from Koh Tao to here. North of Chumphon there are plenty of more smaller beach resorts to stop at like Bang Saphan, Ban Krut, Prachuap Khiri Khan and Pranburi. Next comes the largest resort on the east coast south of Bangkok, Hua Hin and its much smaller and laid back neighbour, Cha Am. North of Cha Am, the last beach resorts before getting into Bangkok are Puk Tian and Haad Chao Samran, both of which can be reached from the interesting town of Phetchaburi which is worth a short stop to visit its Royal Palaces and old Temples.